Kimchee is a mysterious dish that lies at the very heart of Korean cuisine. Korean cuisine itself is a bit of a mystery to most Londoners and indeed the English in general – unless you happen to live in New Malden. New Malden is the premier destination for Koreans heading to the UK and home to around two thirds of England’s Korean population. Kimchee is a dish that you will either love or hate. 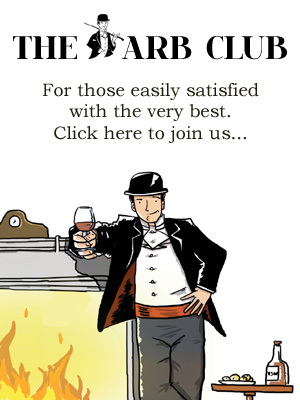 It has deep, piquant, resounding flavours that stay with you. The main ingredient of kimchee is cabbage, which is then brined, salted, vinegared, sugared and spiced, before being left to ferment at leisure. Sometimes, strange additions such as oysters, fish and/or dried meats are involved, adding interesting textural elements to the dish. Thankfully, I fall into the group that is enamoured by its charm, finding kimchee to be a unique and comforting pleasure, but I can understand the misgivings of some: on paper fermented, fishy cabbage sounds like a bit of an undertaking. Kimchee is a new Korean restaurant in Holborn, an area that could be described as central London’s own ‘Little Korea’. The restaurant opened in mid-2011 and has been packed ever since. The design is stunning. Beautiful filigree, wooden lampshades frame the room sending light through the darkness. Burbling water features give the busy, noisy room a sense of calm. 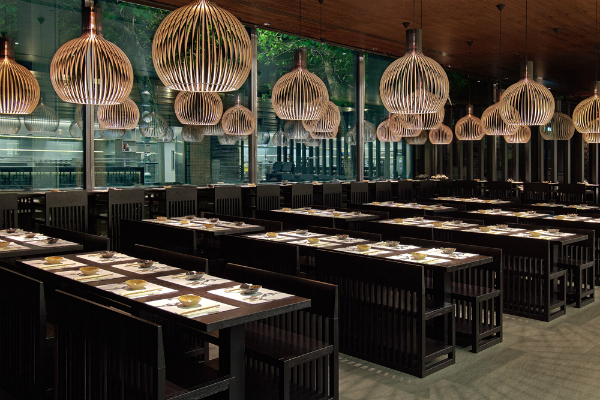 At the front of the restaurant is a huge open kitchen with seemingly endless chefs working away at the Korean barbeque, which forms the backbone of many of the restaurant’s dishes. At night this place is full, heaving with a mix of Korean nationals, hungry families and local media workers. The seating arrangements (tightly packed, shared tables), open kitchen and unforgiving acoustics recall visits to Wagamama, but the design, service and quality of food on offer place Kimchee in a different league altogether. We begin with the eponymous kimchee, which features in several different guises throughout our meal. Initially, it arrives as a side order. The crunch is unmistakeable and the flavours familiar. There’s the sharp tang of vinegar followed by warm chilli and garlic. As far as kimchee goes it is relatively mild, accessible and pleasant. 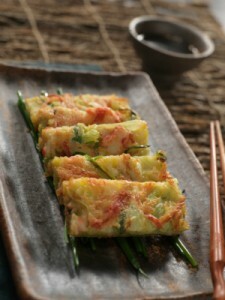 Pa Jeon, the traditional Korean pancake made with spring onions and mixed seafood is a delight – light and crisp with a green freshness that works well as an opener in what is to become a feast. The lights seem to dim a little, a brace of cocktails arrive at table and then without any real prior warning, the rest of the dishes we’ve ordered start arriving at table in incredibly rapid succession. My lord, there’s nowhere to put it all! Hot pot bulgogis, Dolsot Bibimbaps, Japtang Baps and more; they all descend together. This is the idea, food for sharing, food for dipping and slurping and tearing. We eat in dedicated silence for some time, just to make space. The flavours are complementary; it’s clear that this is food designed to be eaten communally, with many small dishes coming together to offer different flavours and textures. 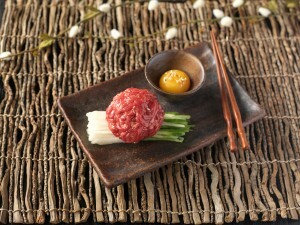 Raw beef is served with a raw egg in the style of a beef tartare, but with the addition of a hot, piquant sauce, when mixed up into a spicy, meaty mush this make for a fine, low-brow pleasure. What’s good about these dishes is that they are relatively high on protein and low in carbohydrate: barbequed meats come with lettuce leaves for wrapping, rather than breads, so the food feel light and nutritious without being stodgy. The food, which seemed like mountains when it arrived, is speedily and happily dispatched, allowing room for a bowl of sweet, fudgy, roasted hazelnut ice cream that leaves us comprehensively replete. Having latterly spoken to a Korean colleague in depth about regional Korean cuisine, its highpoints, idiosyncrasies and requirements, I realise that Kimchee lies at the more generic and accessible end of Korean restaurants in London. This is perhaps an introduction to some of the more challenging aspects of a cuisine that sounds as fascinating and multifarious as you might imagine. That said, as a relative novice, Kimchee strikes me as a perfectly pleasurable way in. The setting is stunning, service bright and professional and food irrefutably delicious. You can dine here very well for £15-20 per head, be a choice glutton for £30.